Anakbayan NY and NJ Anniversary Statement From the streets, campuses, factories and barrios of the Philippines to the communities of Queens, Jersey and several other major cities in the U.S., Anakbayan Philippines celebrates its 13th founding anniversary and 6th for New York and New Jersey chapter. This serves as a testament to Anakbayan’s resilience and also as a challenge to realize its historic and revolutionary role in our people’s struggle for national liberation and genuine democracy. It is with utmost pride that we declare the formation of Anakbayan New Jersey and Anakbayan NY Chapter Organizing Committee, together with the launching of Anakbayan Silicon Valley, as new additions to the growing Anakbayan chapters in the U.S. In 2010-2011, we’ve made huge gains. We were able to breakthrough in organizing and mobilizing the youth. But these gains were not sustained due to weaknesses in organization and leadership. We took one step back, assessed and summed-up our experiences and came out stronger, bringing forth valuable lessons and stronger determination. We must learn our lessons well and put them into practice. Armed with lessons from our rich experiences, the condition is most favorable for us to make our great leap forward and contribute further to the advancement of national democracy towards a new and higher level here in the U.S. and in the homeland. We are witnessing the escalating and irresolvable contradictions of this system called global monopoly capitalism. The 1% continues to accumulate unimaginable amounts of wealth while the global 99% continue to live a life of increasing misery. Massive lay-offs, high unemployment, deteriorating social services on one hand and endless wars for profit on the other. But the world is waking up in this nightmare called Imperialism. We saw the people’s uprisings in Tunisia, Egypt and the middle east in what would be known as the Arab Spring, the student strikes in Chile, workers strike and demonstrations in London and France and the tidal wave of revolutionary people’s war in India, Nepal and the Philippines. Here in the U.S., the youth’s condition continue to worsen. One in every four youth is unemployed. While tuition fees have went up by an average of 8% as states cut down spending on social services. Migrant youth continues to face harsher and more racist laws. It is clear that the youth does not have a bright future under the current system. We need to arm the membership and the community with a clear grasp of the line and program of national democracy through a broad and widespread education and propaganda movement. We must start gearing the organization for campaigns and mass struggles. As the crisis intensifies, we must prepare to participate in Philippines, International, National and Local/Community issues. We must also pay close attention to the welfare of our community. Through systematic and regular integration in the community, we must identify our community’s most urgent concerns, build their collective power and together, launch campaigns to uplift their conditions. In order for us to do this, we must daringly expand the mass membership in a solid and well-rounded way towards the building of a national Filipino youth movement to serve as the primary vehicle of the Filipino Youth in confronting the crisis and contributing to the advancement of the national democratic struggle of our people to a new and higher level. Onwards with the upsurge! Long live Anakbayan! Long live the national democratic struggle! 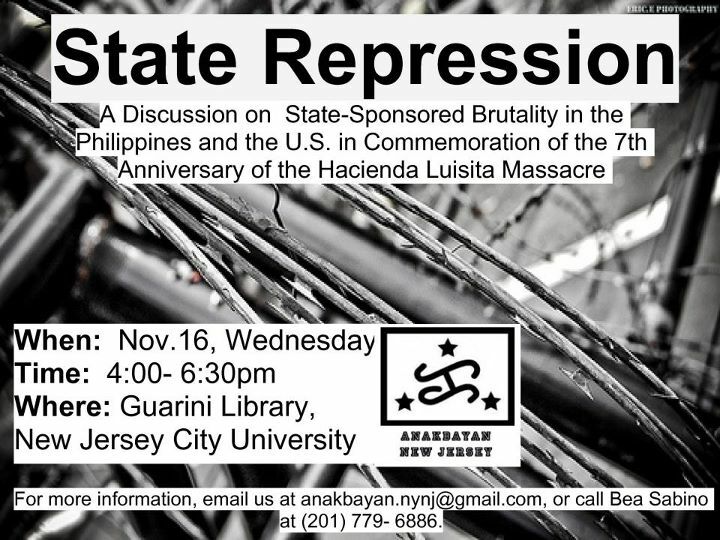 This coming Wednesday, November 16, is the 7th Anniversary of the Hacienda Luisita Massacre. Out of the 4,000 farmworkers who staged a strike against exploitative working conditions, 14 were killed, hundreds were injured by the Philippine military. No one was made accountable for these injustices. 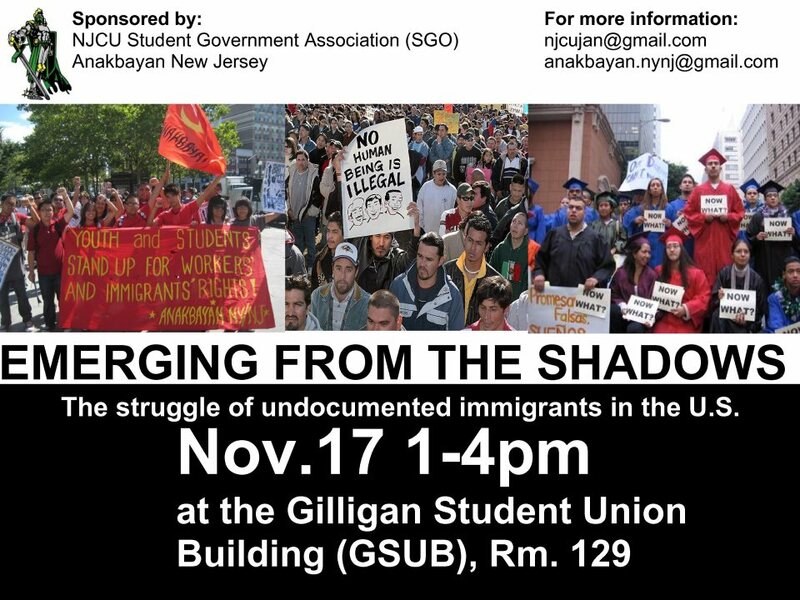 Join us and the Student Government Organization of New Jersey City University for a conversation about undocumented immigrants– who they are, why and how they got here, their contributions to American society, and what needs to be done to improve the present immigration system. Thursday, November 17, 1- 4pm at NJCU. See you there!